Most dogs run around 20 mph. Dogs are incredible runners and odds are your dog outruns you - even if it's a short-legged couch potato. 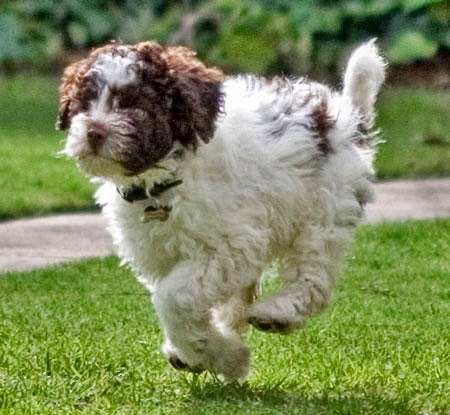 Most dogs can run at speeds around 20 mph. In comparison, the fastest human in the world is considered to be Jamaican sprinter Usain Bolt. In a 100 meter dash, he averages 23.7 mph. The average human slouches around at a running pace of 6-12 mph. The fastest in the dog world are really fast. Here are six of the fastest dog breeds in the world:The Greyhound is generally considered the fastest dog, and they can reach speeds up to 45 mph over short distances. They’re sometimes called the “45-mph couch potato.” Between the speed bursts, they like to lounge on a comfortable sofa. The Saluki is thought to be one of the oldest domesticated dog breeds, dating back at least to 7,000 BC, and over long distances it is faster than the Greyhound. Salukis have been clocked at 43 mph, and the really impressive feat is that they can keep running at that pace. Salukis have padded feet, which helps them withstand the impact of long-distance running. Whippets have been called “The Poor Man’s Racehorse” and the breed originally stems from a mix of Italian Greyhounds, Greyhounds, and terriers. These dogs are small but swift and can run 200 yards in less than 12 seconds. Border Collies are normally associated with their smarts and workaholic can-do attitude, but they are also designed to move at great speed. They’re able to make quick decisions, turn on a pinhead, and keep control even through sharp turns. The breed is very popular for agility, flyball, and disc competitions, and these four-legged race cars keep a pace around 30 mph. Combine that with stamina - herding Border Collies easily run 50 miles every day - and you have a breed difficult to beat. If the Border Collies and Salukis are long-distance winners, few breeds beat the Vizsla when it comes to distances around a mile. They number isn't officially clocked, but many breeders say they've timed their dogs around 40 mph. They are agile and able to make sharp turns, and they swim almost as well as they run. The Vizsla is a Hungarian hunting breed. The Alaskan Husky is another breed that doesn’t immediately come to mind when thinking of speed, but these marathon runners were originally bred to deliver supplies and goods to remote, frozen areas. Under those circumstances, both speed and endurance is a must. A single Alaskan Husky can run around 28 mph. In teams, they can pull heavy sleighs for hours at an average speed of 10 mph. Not surprised GBGV did not make the list. Our short legs are not made for running top speed, but we are fast! I bet - and you're probably pretty tenacious when running after wabbits? I don't think I've ever met a Saluki, but I would love to see one run!